Female chickens lay eggs throughout their adult lives. Egg-laying is automatic and requires no male chickens or roosters to be present. Certain breeds of hens can lay one egg every 25 hours at the peak of their production. However, successful egg production depends on many factors, including diet, health and environment, as well as breed. The average hen produces an egg every 24 to 26 hours and “takes a rest” from egg production when the days are short. Taking these two factors into consideration, the average hen will produce about 265 eggs in a year. Most hens have two productive years of egg laying and taper off as they age. Therefore, the average hen will lay about 530 eggs throughout her lifetime. Illness, the quality of care or of food can make a difference in how frequently a hen produces eggs. 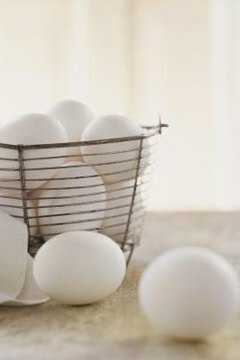 Broodiness, which occurs when hens sit on their eggs to attempt to hatch them, is another factor that reduces egg production. Some breeds are specifically developed for egg-laying. These breeds will lay more eggs than hens of breeds developed for meat or of breeds developed to both lay eggs and produce meat. Egg-laying hens rarely “go broody” and continue with steady egg production. Some of the best egg-laying breeds include leghorns, light Sussex and Plymouth Rock chickens.